Synopsis: Dany plans her invasion of Westeros. 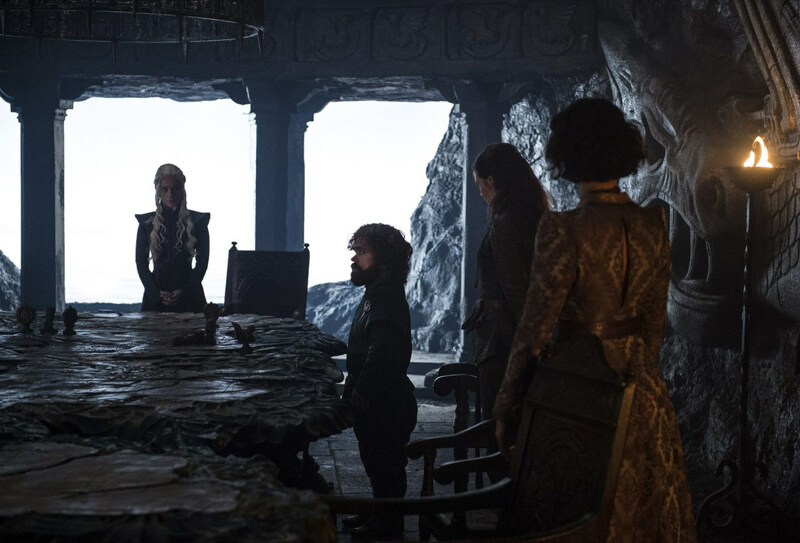 Cersei tries to consolidate power among those who remain loyal, while hatching a plan to combat Dany’s dragons. Samwell tries to help Ser Jorah. In the North Jon Snow considers a dangerous proposal. Arya meets two old friends. Yara and her fleet run into problems on the way to Dorne. Review: Show runners D.B. 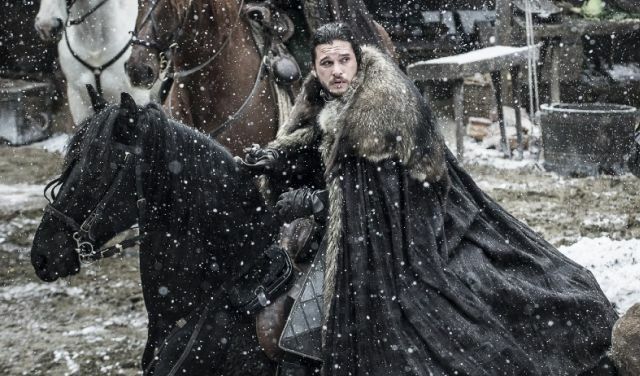 Weiss and David Benioff promised this season of Game of Thrones to be more fast paced then ever, and damn if they didn’t fulfill that promise with “Stormborn.” Last week’s episode ended with Dany saying, “Shall we begin?” and she certainly isn’t wasting any time. Her initial plans seem sound, sending the majority of the fleet south to Dorne while the Unsullied sail for Casterly Rock. The latter is of course mostly Tyrion’s doing but it’s the right move nonetheless. With the seat of power vacant after Tywin’s brother Kevan was killed at the Sept of Baelor, the Rock is ripe for the picking. And I’m sure that’s a plum that Tyrion has had his eyes on for a while. More importantly, Dany does here damnedest to distance herself from her father’s legacy, proclaiming that she will not be “Queen of the ashes” by unleashing her dragons on Westeros. Those are the actions of a tyrant not a leader. While I like this confident streak in Dany, I worry her arrogance could be her undoing. The fact that she confronted Varys and his penchant to flit from ruler to ruler depending on the situation was epic. Many liken Varys to Littlefinger as an opportunist, but I believe that couldn’t be further from the truth. Varys came from nothing and when he says he serves the realm, he really means it. What a poignant moment when Dany commands him to tell her if she is ever acting in a way that is not serving the people…and then tells him that if Varys betrays her she will burn him. Fire and blood indeed. As a leader Jon continues to be wrapped up in his own struggles. He initially decides to refuse Dany’s request, yet Sam’s note about the dragonglass at Storm’s End forces his hand. Again however, Jon has to confront difficult choices and his vassals about his decision. Robb, Eddard, and Rickard (Eddard’s father) all rode South and all lost their lives. The Lord and Ladies of the North seem to think it will be his fate as well. Yet in a brilliant masterstroke, Jon appoints Sansa as leader in his absence. Not only does this satiate the noblemen, it I believe reassures Sansa as well. Jon’s putting a lot of trust in Sansa. He’s a pragmatic guy and I don’t believe he’d do so if Jon didn’t think Sansa could do the job. It’s that same pragmatism that leads me to think Dany and Jon will soon forge an alliance–through marriage. I know ewww because Dany is technically Jon’s Aunt, but Dany said a political alliance through marriage may be necessary last season. However, when it comes to Sansa my gut feeling tells me she will focus more on Cersei and her threat than the Night’s King. Cersei meanwhile looks weak in my opinion. I mean did you see the number of loyal Lords in the throne room? It was barely enough to fill a dugout. And while Qyburn’s giant crossbow idea for dealing with Dany’s dragons looks intriguing, I’m not buying it. We are talking about hitting a moving target after all. Unless they have a slew of these suckers, I doubt the effectiveness of the weapon. Although to be fair there is precedent. When Aegon Targaryen first conquered Westeros, his sister Rhaenys flew the dragon Meraxes. Meraxes was killed by a similar bolt to the eye in Dorne. However, Jamie, lacking this information, tries to rally Randyll Tarly to Cersei’s cause, promising him the position of Warden of the South. While the elder Tarly considers this proposition his son, Samwell, seems to be taking matters into his own hands at the Citadel. It’s amazing the leaps and bounds Sam has made as a person. 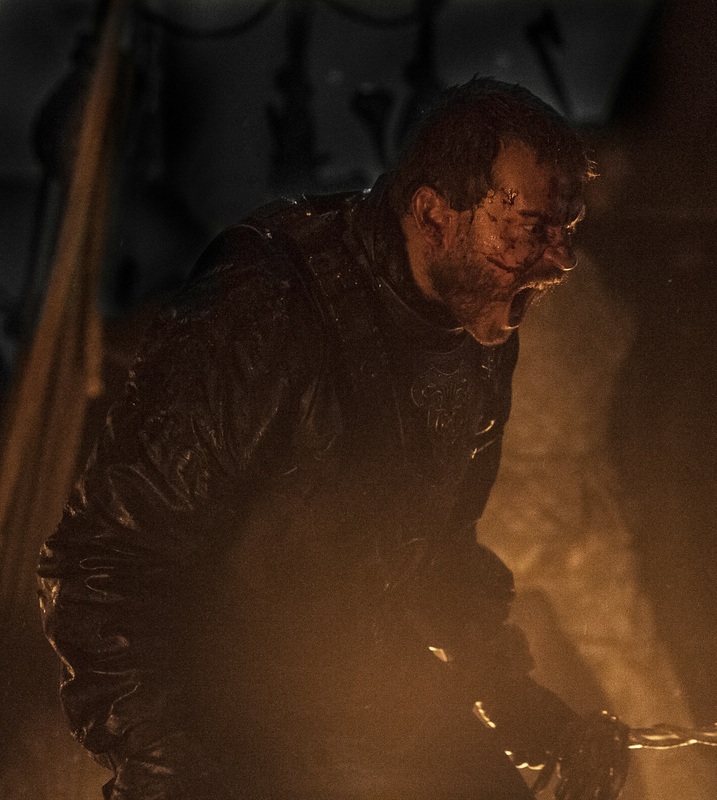 Last year he steals his father’s sword, this season he defies the Archmaester and decides to try to cure Jorah Mormont on his own. Have to admit watching Sam cut off dead greyscale flesh was pretty disgusting. Last week it’s feces, this week it’s pus. Can we get a bodily fluid free week for Sam please? For a show known for shocking scenes (the Battle of Blackwater, the Red Wedding, the Battle of the Bastards, the death of Oberyn Martell) it’s the small moments that often make for the most meaningful. Two in particular from “Stormborn” standout. The first is early on when Grey Worm and Missandei finally express their true emotions for each other, verbally and physically. Grey Worm says something so profound, telling Missandei that she is his weakness. This is a running theme throughout the show, that often times the people the characters love the most, prove to be their biggest vulnerability. Robb, Jon, Cersei, Dany–they can all attest to this. It’s a small moment that resonates. What’s touching too is that, being Unsullied, Grey Worm was castrated. In a sense his love for Missandei is purer than others because the aspect of male sexual fulfillment is removed. The second involved Arya. After Arya encounters Hot Pie (oh hey Hot Pie!) and discovers that Jon is King in the North, she decides to head back to Winterfell. However, on her way there she encounters another old friend, her direwolf Nymeria. Nymeria, you may recall, was forced away by Arya in season one to avoid the wrath of Joffrey. 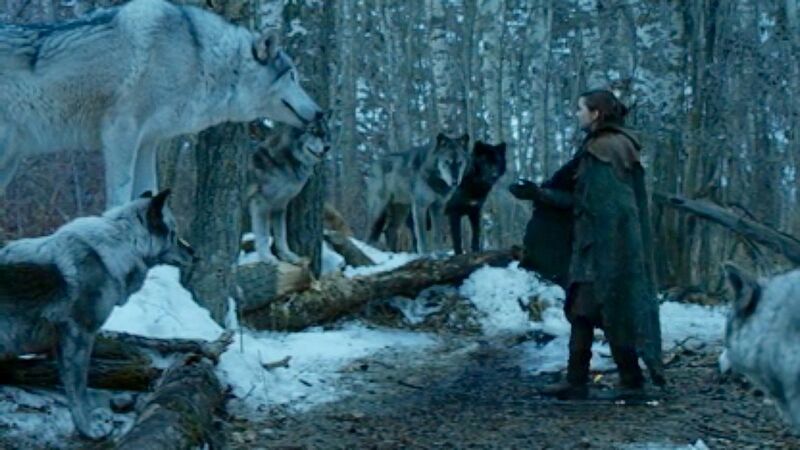 She’s now clearly leading a pack of wolves and although Nymeria chooses not to go with Arya, don’t for a second think that Nymeria and her pack aren’t going to come into play again. Arya also delivers one of the best lines in the episode. When Nymeria decides not to accompany Arya, Arya says, “That’s not you.” Like her former master, Nymeria forges her own path and will not be coerced into anything. Ahhh but screw little moments! The dessert was the final closing minutes of “Stormborn.” Hollleee shiiit. What an epic sea battle. This was unlike anything we’ve seen before. The only thing that comes close was the Battle of Blackwater. To watch Euron approach on his giant ship and leap onto the main deck of Yara’s ship screaming in an ecstasy of violence–goosebumps man. Goosebumps. I think this episode was the closest the showrunners have come to showing Euron’s insanity. Adios at least to two of the Sandsnakes too. I can’t say I’m sad to see them go as that whole storyline from the books was horribly mismanaged. Looks like Ellaria Sand has been taken captive by Euron. Pretty sure that’s the “gift” Euron will provide Cersei, the very woman who killed her daughter. And goddamn it Theon! Just when you were starting to grow on me again you turn tail and run, or in this case dive. What a fitting ending to the episode as we see Euron’s flagship Silence, sailing away in…well…silence.